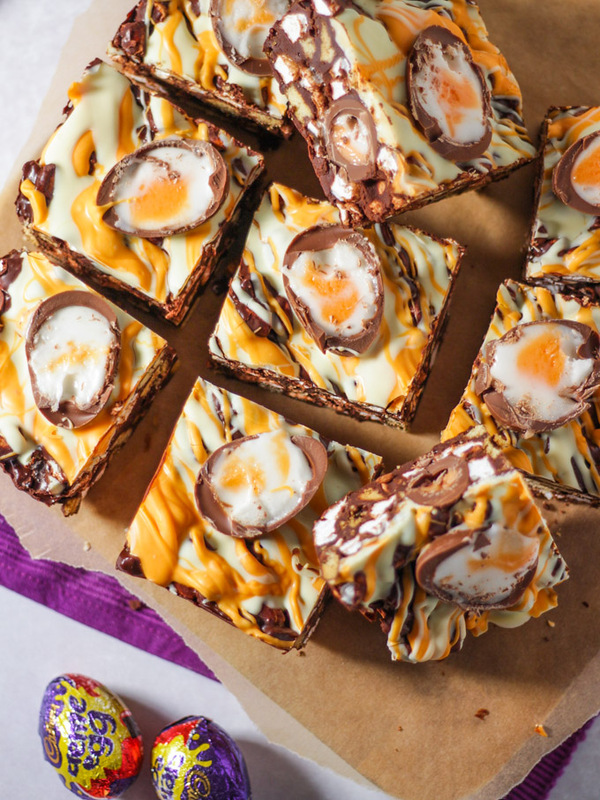 Creme Egg Rocky Road - How to Make the BEST No Bake Treat! 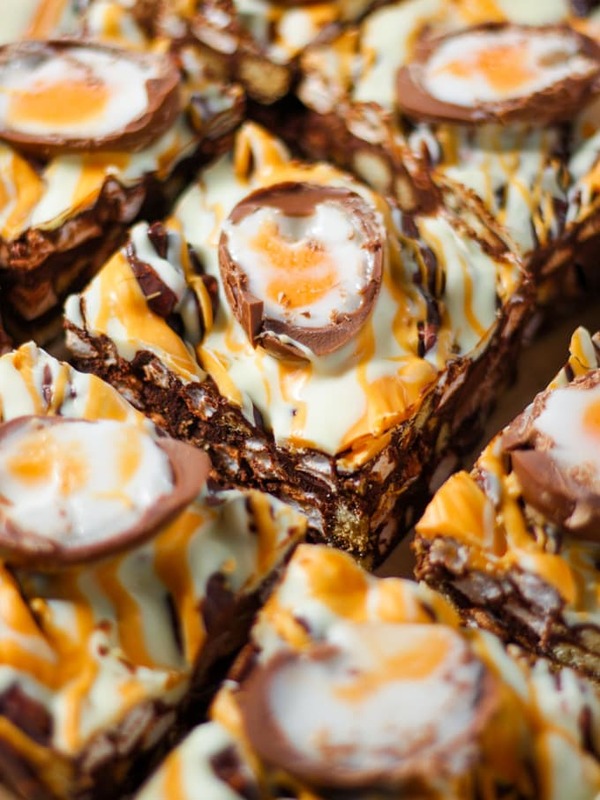 Super easy, no bake, utterly delicious Creme Egg Rocky Road recipe. Great for bake sales and making with kids, the best Easter chocolate treat! This no fail chocolate dessert recipe is a must make for Easter. I thought I’d give it a little facelift this year and a new video to show you really how easy it is to make. Even if you’ve never baked or cooked, honestly, this is so easy and fun to make. George and Harriet love helping to make this. 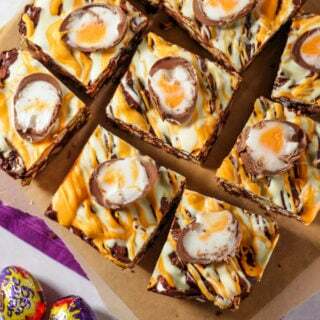 We will probably make some of this or a batch of my Slow Cooker Creme Egg Fudge for their teachers at the end of term. Melt together your chocolates, butter and golden syrup. You can do this in the microwave as I did in the video or in a pan on the hob as explained in the recipe below. Allow to cool slightly and then add crushed biscuits, marshmallows and Mini Creme Eggs. Press into a lined tin and drizzle with more chocolate (coloured if you fancy) and Creme Eggs. Chill and then cut and enjoy! Things to remember when you make the Creme Egg Rocky Road! You can melt everything in the microwave as I do in the video, just a couple of 30 second bursts with a good stir in between. DON’T cook for any longer at a time or you’ll burn the chocolate. 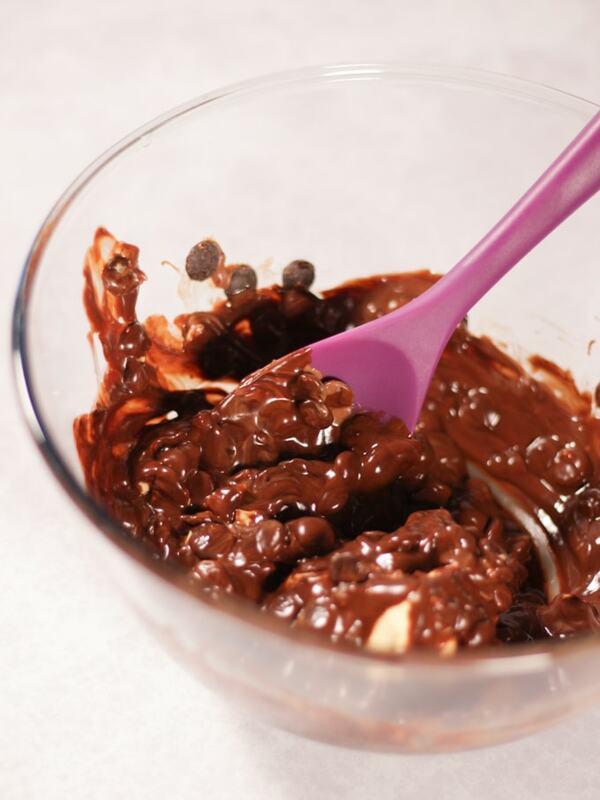 Make sure that the mixture has cooked slightly before you add the Mini Creme Eggs or they’ll melt. To be extra sure that the Creme Eggs don’t melt, pop them in the fridge or freezer for an hour (or more or less depending on how much time you have!) before using. If melting the chocolate mixture on the hob, make sure you do melt the butter slightly before adding the chocolate, this stops the chocolate from burning. Only use a very, very low heat. Or the chocolate, butter, syrup mixture will seize and go grainy. OR as I did in the video, use the microwave, in short 30 second bursts! BULK buying these babies in case the shops run out again this year! 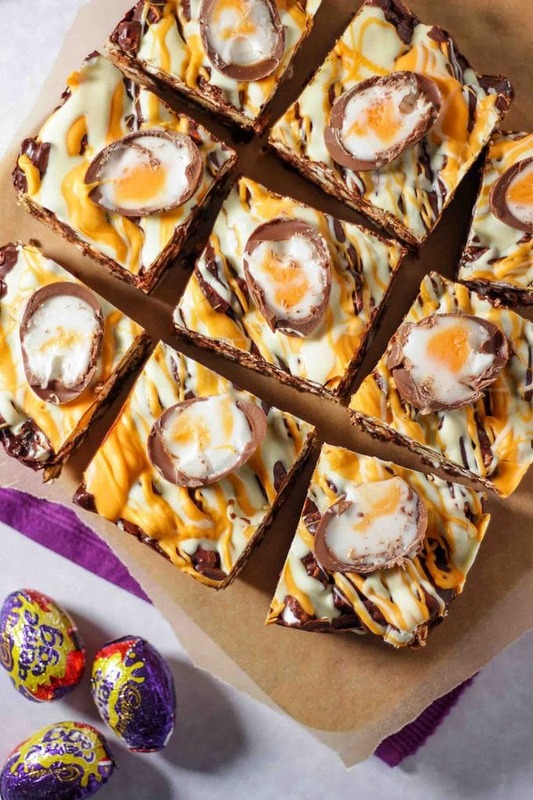 This Creme Egg Rocky Road recipe is the perfect bake sale make. Easy but super impressive looking, right on seasonal baking trend, can be made in advance and no need for anything fancy schmancy. If you don’t feel like it, you can leave off the colours chocolate on top and just use white chocolate. 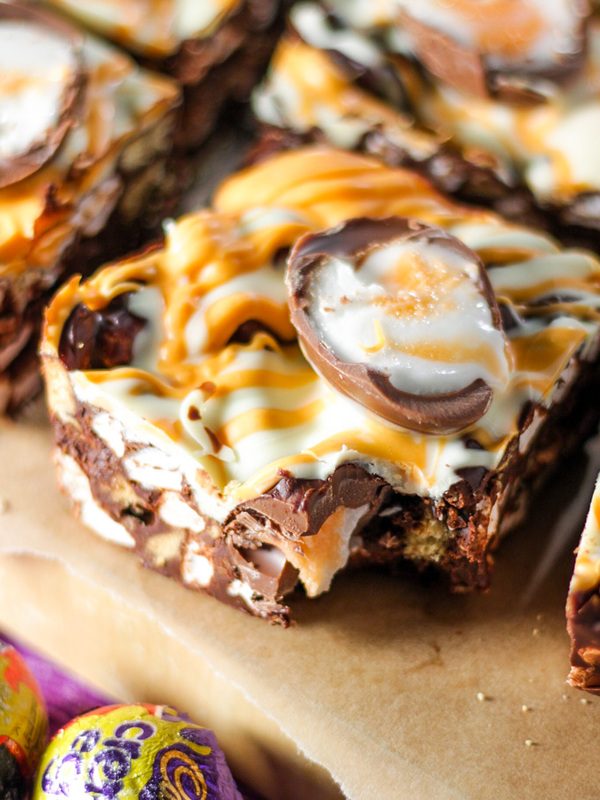 A full on chocolate rocky road treat full of creme eggs. When it's about half melted, add the dark chocolate, the milk chocolate.and the golden syrup.Over a very low heat, continue to melt it all. Stir until it's thick and well combined. Take half of the melted chocolate and put in another small bowl, colour until very deep yellow using the gel food colour, just a very small amount at a time. 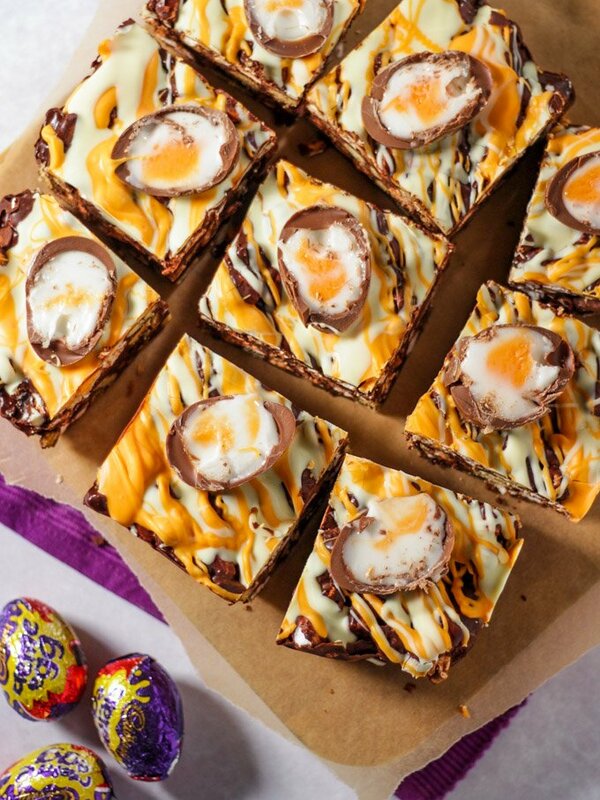 Drizzle the white chocolate and the coloured white chocolate over the rocky road, cut the full size Creme Eggs in half and sit in the chocolate, pressing in firmly. This looks amazing! I love normal Rocky Road but this is even better! Yummy! I was kindly sent some of the said creme egg rocky road as a gift from Sarah and I confirm it’s amazing & truly delicious. Must get round to making some myself soon ? I’m holding a bake sale for sport relief at my work! There will definitely be creme egg bakes… and I’m doing a post about the top bake sale cakes! Oh my!!! How amazing is this?! Definitely going to be making this!! I’m dribbling just reading the recipe! I can’t believe the amount of SUGAR in this recipe, before you even get to the mini eggs and creme eggs! You’ll never tame your toddlers with this! Thanks for your comment Concerned Granny. 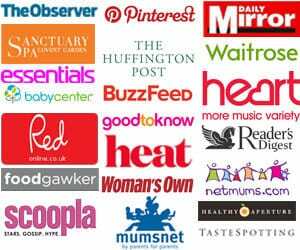 I’m really lucky that my kids eat a hugely varied diet and love all of the good unprocessed foods I cook for them, which make up the vast bulk of their daily food. I believe that very small amounts of treats (yes, including sugary ones) are perfectly okay as part of a balanced diet and teaching them to enjoy sensibly and with moderation is actually a better lesson than complete abstinence. Thanks again for your input. Have just made some of this and OMG!! Yummy doesn’t even cover it! This looks so nice , can’t wait to make it for our easter party. Just made this!! Ready to bring over to the boyfriend’s family house!! Made these as Easter gifts instead of eggs, fab recipe thanks for sharing! I was literally drooling at the thought of this and then glancing at the ingredients I saw Mini Marshmallows which I am sure aren’t vegetarian. Is this recipe alright without those or are they a vital ingredient? If you cannot eat marshmallows then you would not be able to eat chocolate cream eggs!